After Rigning Bells Freedom 251 Mobile Its Docoss Again Come Up With Similar Mobile Docoss X1 Mobile At Just Rs 888 Only. Online Booking For Docoss X1 Smartphone Has Been Started 27th April 2016 @ 6 Am on www.docoss.com . * 4-inch (960 x 540 pixels) IPS display. * 1.3GHz Dual core Cortex A7 processor. * 1GB RAM,4GB internal memory,expandable memory up to 32GB with microSD. * 2.0 MP rear camera. * 3G,WiFi 802.11 b/g/n and Bluetooth,GPS. So UnLike Freedom 251 Docoss 888 Rs Mobile Will Available For Online Booking As Well As Offline Booking Via SMS. 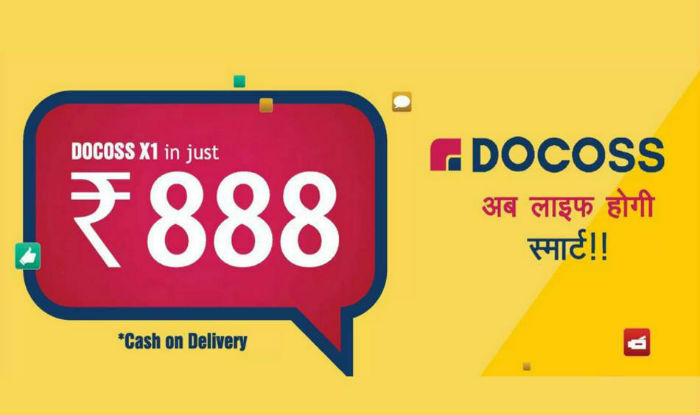 Just Follow Below Steps To Book Your Docoss 888 Rs Smartphone/Mobile.